I would like to see a "my pending flags" page/section developed. This may page may also allow the user to "unflag" accidentally flagged questions or questions that have been revised. I think such a page would greatly increase the flagging efficiency of both myself and other users. We also show you a full list of all the posts you flagged. Not the answer you're looking for? Browse other questions tagged feature-request status-completed flags . How can I verify that my flag was recorded? 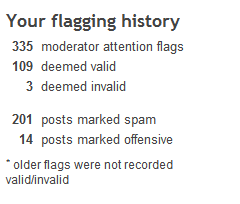 Can the “Flag for moderator attention” have a feedback mechanism?